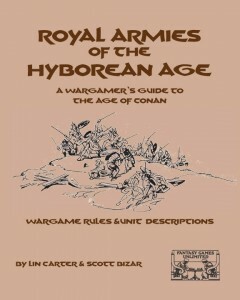 That these fantasy wargames rules, first published in 1975, are still in print, or at least available in PDF, is less a testament to these rules and much more about the strange business habits of Scott Bizar, who kept products technically available, if for no other reason than to prevent the rights reverting to the author. I am reviewing a printed copy, that comes with a card rules summary, but these days you can only buy, as new, the PDF version here. This is not a complete game, you will need percentage and average dice, figures, terrain and a tape measure or two. As the introductions make clear, Lin Carter’s contribution is for the “fluff” of the world, but the rules are Scott Bizar’s. REH shared a problem with many authors, including JRR Tolkien, that they did not take us gamers into account. They write no Orders of Battles, inventories of equipment, description of supply arrangements, ranges and effects of spells. It’s almost as if they did not think of us when they wrote. They couldn’t have been that thoughtless? Could they? “Royal Armies” is concerned with set-piece field battles of organised armies. If you are looking for the set of rules for the Cimmerian attack on Fort Venarium, then it’s not these. The number of turns in a battle are limited, simulating effective daylight/fair weather. Commander should write orders at the start of each turn for what they want their units to do, including the magicians and the spells they wish to cast. Each turn has two phases. They can perform an action (change formation, change facing or move) in each phase, as long as it’s not the same action (cavalry get to chance face and formation as part of a single move). Movement and Combat is held to be simultaneous, rather than IGOUGO, which means that some fiddling has to be done occasionally to reconcile the actions. Formations affect movement and combat, a column moves faster than a ring or a line, but a line can bring more of your strength into battle, and a ring stops you having a rear or flank. Terrain also affects movement and combat, including when archers can fire over units in front of them. The presentation is dated, but this is from the days before DTP, or even mass word processing. It is typewritten and printed in a light brown colour for some reason. there is no column layout or sidebars, all the text across all the page, and few illustrations, though at least those are by legendary Conan Illustrator Roy G. Krenkel. There are no pics of figures in battle. There are not even drawings of the national flags/symbols, just descriptions. The organisation of information is primitive, there is no simple step by step summary of the turn sequence for example, so you have to read through the text. You will find yourself flipping back and forward so, if you intend to play, you are better to print these rather than use a tablet or ereader. Scott Bizar has made some compromises from what he would have written for some rules and what suits the Hyborian Age. Historically the morale of armies determines who wins or loses. The loss of life can be relatively light, and many seem to come when the victors pursue the losers as they run away, but in Howard’s world units fight to the last man, so they are more likely to do so in these rules. Even failures in morale don’t cause units to disappear as they do in more modern rules, instead they retreat or lose some figures but will fight on. The authors admit that some of the choices made might seem out of sorts with the stories. they also not that although arquebuses feature in one story, and crossbows in other, they don’t think these are suitable weapons, though crossbow rules are given. To compennsate, some armies get wooly mammoths! The game also features some notes, I hesitate to call them guidelines, never mind rules, on running a campaign. 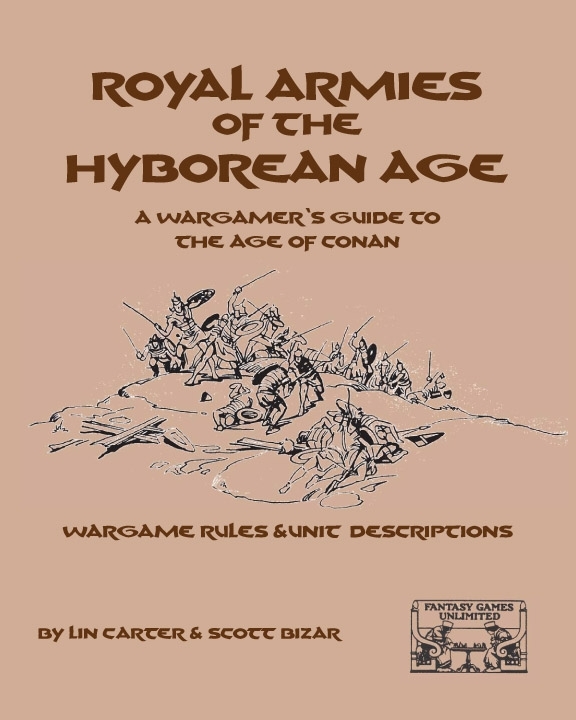 If you have read anything else about running wargames campaigns then use the information there and adapt to your Hyborian Age campaign. There are compromises here too, not all nations are considered strong or organised enough to take part in a campaign, so might be better used for random events or for one player to invade then another player defends with an army from that nation. In addition, Khitai and other places are missed out as being too far away. If you want to run a campaign there will be a fair amount of work to do, on campaign maps, counters for armies and random terrain generation. The campaign is split into 35 turns, which are the number of weeks in a year that campaigning is practical. The wargame uses units of single figures, with a 20 men to a figure scale, though it recommends mounting figures in groups of 3, with one of those groups split into a base of 1 and another base of 2, to aid in casualty removal. Unlike many of the rules at the time, the troop types are kept simple, no WRG obsession with insane classifications of morale, arms, armour and training so the troops are infantry/cavalry/chariot, light/medium/heavy, there are only 3 levels of training/morale determines and the only differentiation in arms is to note any spear/pikemen or archers. This is partly down to the variation in the “age” of the troops described in the stories. The Stygian are like Ancient Egyptians, but the Aquilonians would not sound out of place riding with the Black Prince 3,500 years later. Corinthians come between the two, they need to simplify to gloss over the discrepancies. “Royal Armies” uses units comprised of single figures. The listing of the nations tell you how many figures are in a unit, along with the morale rating and the armour weight. E.g. A unit of Shemite archers are 18 B class Light Infantry figures whereas a unit of Bossonian Archers are 24 Medium Infantry figures. There is a point system (suggested army point value is 1500) but the points cost is not given in the description of available units, so you will have to calculate these yourself. When buying your armies you have to also take into account percentages of how many of a given type can be in that nation’s army and, just to be complex, the proportion is not in points, but in figures. There is a reason for using single figures rather than element bases. Not only does that allow for changing formations but the number of casualties inflicted is calculated as a percentage of the number of figures able to get involved n the fight. Both melee and missile combat use an averaging die (not 1-6 but 2, 3 – 3, 4 – 4, 5 so use a normal die but count 1s as 3s and 6s as 4s) and the result multiplied by the number of figures is the percentage of casualties caused. No saving die here. Here some maths is involved, you take the percentage off the number of TROOPS being aimed at, at the 1-20 ratio, and you then take off 1 figure for each 20 casualties caused. e.g. 12 Nemedian Archers fire at a unit of 10 Gunderman Pikemen, they have already taken some casualties. The roll is 2 and therefore 24% of casualties have been caused (2 rolled x 12 figures). 10 Pikemen figures represent 200 men, so 24% of 200 is 48 round nearest so 2 figures are removed. (That’s how the rules express it, you could just work on the percentage of figures without bothering with the ratio conversion). Of course it would not be the Hyborian Age without Heroes, Generals and Magicians. Each army has a commander, represented on the field by a figure with no combat value, but with the ability to bolster morale. You can only have one Hero per 750 points, Superheroes cost two heroes. Magicians should not be the focus of an army, and only Stygia might have magicians as a regular part of the army. Not all armies will have magicians, but an appendix lists the various mage organisations, who they might work with and the costs for a mage and the limitations. For example, a Pictish army might have White Druids, but, as their magic needs the use of intoxicants, they have a 50/50 chance of being too insensible to be of use. The point cost of the magician, is also the number of spell points they have to cast spells, the more magicians, the more spells you have available. Spell use has to be planned and written into your orders. There is also the chance that spells will backfire. Such fun! And yes, you can collapse hills onto enemy armies if that is your tactic, and try to capture the hero and Thoth-Amon is powerful. These are a very usable set of rulesy. Yes, they could do with editting and better organisation, but they are vary playable and give a reasonably fast game. There are nice little write-ups for each of the nations and the magical societies, but the view of the Hyborian age is Lin Carter’s, so you may disagree with some of it, but the rules have concentrated on land action for the big armies and they let you get on with that. There is obviously no easy link to your role-playing campaign, but it should not be beyond a group to do this, though they might want to have someone act as umpire if playing the campaign version. If you want to set up a wargames campaign then the classic book would be “Setting up a Wargames Campaign” by the late Tony Bath, particularly as his most famous campaign was the “Hyborian Campaign”. You can find out more about that here and here. This entry was posted in none yet, reviews, Wargaming. Bookmark the permalink. These figures are still available? If so Where? C’était il y a trente-sept ans! If you want to wargame with them then for most of the nations you can use historical figures with a few fantasy additions. 10mm scale has plenty of both.